Moonstone Healing Crystals. Properties and meanings of this Power Stone. Moonstone is associated with the Moon, the feminine, intuition, the heart and fertility. It also has associations with rejuvenation, fresh starts and new beginnings. 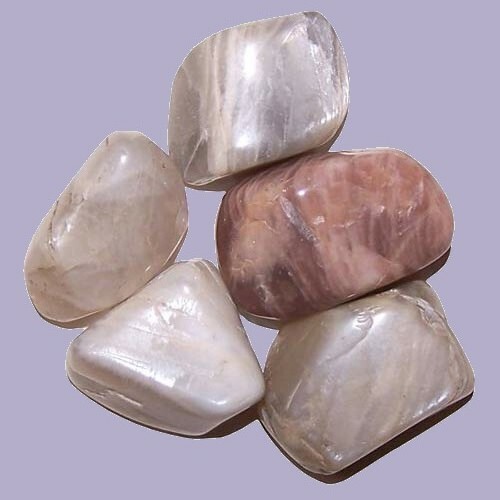 Moonstone is particularly useful for easing emotional trauma, lessening grief and coping with loss. It is said to assist with the cycles of change. It balances the fluid systems of the body and is ideal for all problems related to fertility, menstrual cycles, hormonal imbalances, and all female related health issues. Moonstone is connected with the Element of Water, the direction West, the zodiac signs of is Pisces, Scorpio or Cancer. It is also connected to the Tarot card of the Moon. Magical purposes for use in rituals and Spell work associated with Moonstone are for love, protection, weight loss, youthfulness. Also it is used for healing, enhanced prophetic dreams and Psychic connections. Because of its connections to the Moon itself and to the Goddess and all things feminine I use this stone a lot in rituals and Spells. It is an ideal stone for meditation and for increasing spiritual awareness and is linked to Crown Chakra or Third Eye. It helps in being receptive to intuition, to Psychic connections and to lucid dreams. It is very reflective of moods and promotes inner harmony, calm, love and happiness. Moonstone is associated with all goddesses, but especially the Moon goddesses. The ancient Greeks named the stone ‘Aphroselene’ after the goddess of love and beauty, Aphrodite, and the moon goddess Selene. In the East in ancient times, people believed Moonstones were actual rays of moonlight that had solidified, and that the shimmering light within the stone was a good and benevolent spirit that resided there. They were considered as very lucky amulets. Moonstone comes in a variety of colours and shades, but is most often a whitish blue. It comes from the Feldspar group of gem stones and has a hardness of 6. It is found mainly in Sri Lanka, Madagascar, India, Tanzania, Brazil, USA and Mexico. I use Crystals in my Magic Spell Casting to change destiny for the better!! !